This year, Form One students reported to school much earlier than in previous years. Our Form One orientation was done on Saturday, 7th January 2017 in the common room. The Form 1 students were welcomed by their Class Teachers who took them through the school procedures. 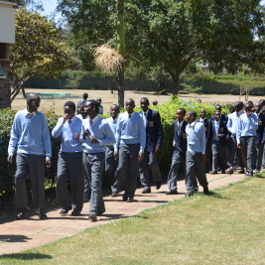 The form 4 captains further took them around the school as they familiarized themselves with the new environment where will spend their next 4 years.